Today is a big day for Verizon Wireless customers. Today they unleashed a plethora of phones for those who were interested in upgrading or becoming new customers. Starting with the 4G LTE enabled LG Revolution, the first phone that was preinstalled with Netflix on board before the official app came out last week. The LG Revolution features a 4.3-inch touchscreen, Android 2.2 Froyo, and last but certainly not least, a blazing fast 4G LTE radio. Hopefully you have an extra battery or two that you can spare due to all the Netflix you’ll be watching on that nice screen. The Revolution is the priciest device released today going for $249.99, but who’s going to complain with that extra boost of speed you’ll be receiving from Verizon’s LTE network? Next up we have the first ever PlayStation phone, the Sony Ericsson XPERIA Play, which is powered by a second generation snapdragon processor and custom graphics chip to enable smooth console-like gameplay on a phone. The PLAY features a 4-inch WVGA display, Google’s Android 2.3 Gingerbread OS, a slide-out dedicated gaming controller and a $199.99 price tag. 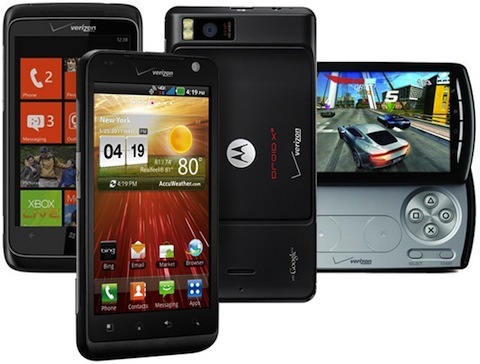 The next phone released is a sequel to the often praised and favorite to most Androidians, the Droid X2. This mammoth of a phone still features the same camera and 4.3 in screen as the last one but ups the resolution to 960×540 and is what Motorola likes to call qHD. Under the hood the X2 was also given a nice boost in power with a Tegra 2 dual core processor. The X2 wasn’t given the almighty LTE radio but don’t miss out this beast of a device just because. This is most likely going to be the best 3G phone out this year. At $199.99, this is an offer that you can’t refuse for something that powerful. Last up we have the first Windows Phone released for Verizon, the HTC Trophy. For you Windows fanatics, this phone has exactly what you’ve been waiting for since the release of WM 6.5; a nice and extremely polished UI, 1Ghz Snapdragon processor, Bing service and connect to XBOX Live. Its the cheapest out of the phones today at $149.99 so don’t miss out on your chance to grab a nice sleek device. Now that the info was just laid down for you, the only question is “Which one will you get”? I used to be suggested this website by my cousin. I am now not positive whether or not this post is written via him as nobody else recognise such particular approximately my problem. You are wonderful! Thank you!